Back to Basics. Best cure possible. ≈ Comments Off on Back to Basics. Best cure possible. Please pardon my absence – been hard at it and just completed two weekends away, hence no meaningful opportunity to give lots of thought to this blog. While I was away, however, something happened which I felt worth a good chroniclin’. We had gone out for an evening meal in a busy restaurant and I suddenly felt absolutely miserable. Not wishing to demean ‘real’ depression, but I felt so absolutely and irrationally fed up, all of a sudden, that I could imagine that feeling that way all of the time must be hell. I didn’t like it. All kinds of emotions welled up, and I decided in a moment of utter pain that I would delete each and every mission statement and values list I had ever written and stored on my computer – and start again. That, I thought, should sort me out. Well, it didn’t. I did delete all those records, and I did reconsider my values, principles and mission statement. And guess what happened? Yup, exactly what I should have expected. Anything I wrote reflected what I had always written. My vales were still what they have been for a long time; my objectives stayed the same; the words got jiggled about but the meaning remained constant. When you feel down, it isn’t necessarily changing external things that will solve your problem. Your emotional problems are often solved by reflecting on and returning to a focus upon what you should have been doing in the first place. My problem wasn’t that my mission statement was wrong; my problem was that I wasn’t properly living it. I wasn’t exercising (hadn’t for a week); my writing wasn’t getting done (too ‘busy’, apparently); some short term plans hadn’t come to fruition and I’d allowed an empty space to develop. But through reviewing my PMS I rediscovered what I am for. The PMS is a reminder of what you/I can be when I/we are at our best. It is a constant that we can rely on. All that said, there is something I am going to do to my Three Resolutions PMS. And that is I am going to turn it upside down. 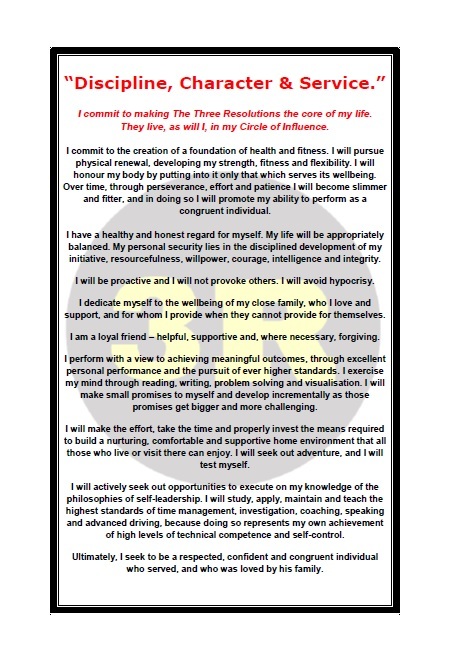 While development of your compliance with the Three Resolutions starts with self-discipline and develops towards purpose and service, execution of the Three Resolutions should start with Purpose and Service. Nobly serving others with excellence, in the field you have chosen, or ‘just’ your family and friends. That’s what’ll make you happy. Something challenging is coming. So what? ≈ Comments Off on Something challenging is coming. So what? When things change, we desperately scream about unfairness, the loss of what was, the inconvenience of what is to be, and No, this is not about Brexit even though it could be, just as it applies to any change. The fact is that people are reluctant to change, so create emotional rationales for why it shouldn’t happen, even when logic suggests that some of the things we fear are not actually facts. For example, I just heard Andrew Marr on the BBC bleat again about how money from Europe funded Universities and now that’s at risk. Well, AM, as it was OUR money before it was THEIR money to hand it out, perhaps WE can fund the Universities ourselves? Ergo – fear IS False Evidence Appearing Real – to the uninformed. Change, ladies and gentlemen, just IS. It is the only true constant outside maths and physics. How we respond is usually based on a couple of factors. Did WE plan it – if so, it is ‘good’. Did our bosses plan it – if so, it is ‘bad’. Can we deal with it? If so, good. If not – what the hell is wrong with you?! If you have an unchangeable set of core values, I suggest that you can cope with absolutely anything that comes to pass. You can use your unifying principles, values, credo, mission statement (whatever you choose to call your life’s philosophy) to deal with change. New job – treat it by applying your mission statement to it. New relationship – treat it by applying your values to it. New home – create it with your values and mission in mind. Tragedy – focus on your values and beliefs and work through it. In the end, who you are can be the one thing, the only thing you have that need not change. Hold on to what you believe, be willing to accept alternatives if you discover them; but hold on tightly to what you are, and what happens will be easier to endure. Always. It’s a lot easier, more productive and ultimately a lot less tiresome and noisy than sheer panic. ≈ Comments Off on Manage your life. Do you have a plan for the coming week, or are you reliant upon others directing you? Of course, some work is boss-directed but that accounts for one third of 5/7ths of a week (5/21ths = 23.8%). In other words, using the ‘my work is chosen for me’ excuse covers ¼ of your week; sleep accounts for another third, which means that the remaining 41% of your week remains within your control, or lack of such. If you have goals, that 40% must – must – be spent, at least in part, in pursuit of those goals. If your goals are work focused then work time should include activity directed towards those ends, but some effort towards work goals will have to take place in the 41% – studying for professional exams, for example. But remember that life is there to be enjoyed, too. The objective for time managing your life is to make sure that you plan time for what has to be done, but also for what needs to be done in terms of self-renewal. 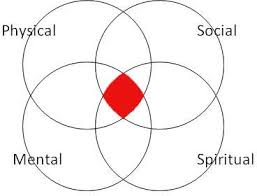 By that, we mean renewal in the 4 human dimensions – mentally (growth), socially (relationships), physically (exercise, rest, sleep) and spiritually (meaning). Plan your week with those 4 parts of your life in mind. Around those necessities created by work and ‘life’, plan time with yourself to exercise, read, meditate, learn, and so on. Plan an hour’s exercise at least 3 times a week – exclude travelling time in that hour! Plan to read at least one book – two, if you like fiction, because non-fiction makes you better, too. Listen to your loved ones and express your love for them. And think about what it is you’re about – connect with your Personal Mission Statement and remind yourself about the way you chose to live your life. Serve others as much as you can while you do all these things. And do all this before the week begins. I do it on Friday, at the end of a week when I can see what progress I’ve made and can choose what further effort is called for. You might choose Sunday night, Saturday or Monday morning, or the start of a series of work shifts. People tend to use the start of the working week and do that planning at their workspace. This means that their plans tend to be work-focused. This isn’t necessarily wrong – just don’t forget the other stuff. Plan weekly, adapt daily. But focus on your mission.